- "No Hillary, that's not what you think. I didn't inhale her perfume." - "Sure you don't want my advice? To block Bill Bradley, I'd hire The Shaq. And for your running mate, get yourself a Joe with a six-pack smile. Biden, not Lieberman. Just sayin', but mark my words." - "Chappaqua sounds nice, but how will we pay for the house? We're already drowning under legal bills - and speaking of water, heard of any potential Whitewater scheme around?" - "Don't be mad at me Mad, but I won't intervene in Sudan to get bin Laden. That country's so fragile it could break in two." 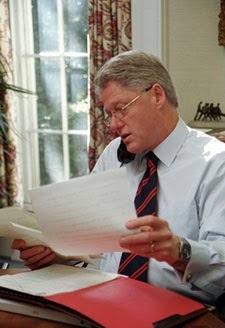 - "What do you mean Hillary didn't like that intern? I checked her credentials and they look terrific: she not only worked for our D-Fla guy, but also wears D-Cup." - "Yes, I'll consider your request to pardon your son... but frankly, who cares if he drove under influence as a youngster? Dubya's already way out of his league as Governor of Texas, and it's not as if he were running for something really big, uh?" - "No, Al, that's not what you think. I was not making a pass at Tipper, and we're not communicating through codes - don't tell me you also invented the telegraph." - "No, Boris, I don't hate you - but you must understand that I can't join you for that vodka party in your dacha right now." - "You don't have to worry about Rudi Giuliani anymore. And same thing about Chappaqua: Lawrence Summers and Alan Greenspan got me the best mortgage offer - they told me it was like Al's internet, a sure bet." - "What are you doing this July, Ehud? Fancy spending some time with friends in Camp David...? Who will come? Uh... some friends, you know, around a good barbecue - kosher, of course. Please bring your knife for the cake." - "What are you doing this July, Yasser? Fancy some time with friends in Camp David...? Who will come? Uh... some friends, you know, around a good barbecue - halal, of course. Please bring your own territory." - "No, that's not what you think. She was talking about my saxophone. I just told her to play our favorite song, you know? Fleetwood Mac's 'Don't Stop'..."
- "Uh... three Extra Value Meals, please: one Double Quarter Pounder, and two Big Macs. With Coke, yes. Oooops wait a sec' - I almost forgot the girls: Hillary, Chelsea, what will that be for you?"